Henio Arcangeli, senior vice-president of automotive operations for Honda Motor Co’s US unit, speaks during an interview in New York. 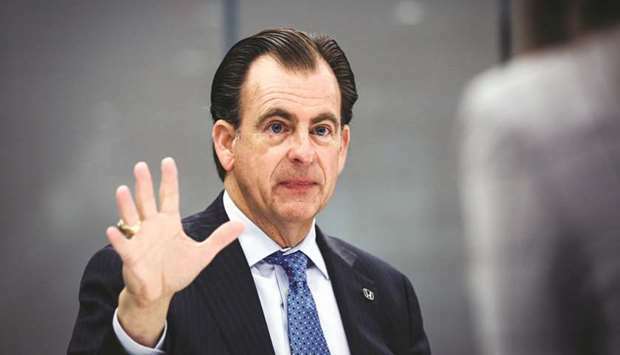 “Many people are talking about the demise of the passenger car, but if you just do the basic mathematics, there were over 5mn passenger cars that were sold last year and will be sold this year — that’s a huge market,” Arcangeli said. Those people are the ones from Volkswagen, Nissan, Hyundai and Honda who, at this week’s Detroit auto show, politely asked that the world not get too carried away in declaring the death of the passenger car. They’re confident in their ability to sell sedans profitably even as Fiat Chrysler, Ford and General Motors drop low-demand car lines to focus instead on SUVs and pickups. These light trucks account for about 70% of the US market, a figure that may reach as high as 75% before the sedan shunning is complete. There’s a distinctly geographic divide to the debate. Companies based in the US, which led the shift to trucks and SUVs, are the least reliant on cars. Asian and European manufacturers, who sell in more places where sedans are popular and profitable, are more likely to retain a stable of car models. Other than when recessions put up road blocks, light trucks have grown steadily since accounting for just under half the US auto market in 2000, according to IHS Markit. When gasoline prices surged in 2008, some analysts predicted the popularity of pickups and large SUVs might never regain their former lustre. Instead, only about 20% of sales volume at Ford Motor Co and General Motors Co came from cars in 2018, according to Autodata. For Fiat Chrysler Automobiles NV, it was slightly less than 10%. Even last year’s biggest seller of sedans in the US — Toyota Motor Corp — got 63% of its volume from light trucks, according to Autodata. Cars made up 45% of Honda’s volume and about half of sales at VW. US automakers’ stampede away from sedans has been a boon of sorts for Hyundai Motor Co, said Brian Smith, chief operating officer for Hyundai Motor America. As other companies exited some passenger-car lines, that created a vacuum in segments such as sedan sales to corporate and government fleets. Hyundai has been glad to fill those gaps with its models, Smith said. Even so, Smith says Hyundai is at a tipping point, and this year will have enough SUV models in its lineup to edge just ahead of its car sales. Already in December, about 53% of the vehicles Hyundai sold were light trucks. For 2019, he said that number should average about 55%. Volkswagen AG’s top-selling US model is the Tiguan SUV, but its second-best seller is the Jetta car, Scott Keogh, chief executive officer of Volkswagen of America, told reporters. And the core car market where VW focuses its lineup is still more than 4mn sedans, he added. “This is still a market we believe in — we have to believe in it in a smart way,” Keogh said. The car also has a future at Nissan Motor Co, which got about 60% of volume last year from light trucks, according to chief planning officer Philippe Klein. Nissan will continue to focus on models such as the Altima as more buyers shift to trucks because the company doesn’t see “the sedan going to zero,” he told reporters. Even the companies that have seemingly thrown in the towel on the sedan are at least keeping a toehold. The car might present an affordable option for consumers who can’t afford more expensive SUV models, said Steve Majoros, marketing director for Chevrolet cars and crossover SUVs. Chevy got rid of the large Impala because buyers who could afford its base price of $28,000 were going to SUVs. But the $22,000 Malibu will find buyers, he said.